Sophie Allain reveals the shocking disparity between British fares and those in the continent. Sophie Allain is the Campaign for Better Transport’s public transport campaigner. We knew we had some of the most expensive rail fares in Europe, if not the world, but even we were shocked when we compared a sample UK season ticket with four similar European ones. Our UK ticket cost three and a half times more than the most expensive European one and almost ten times (9.7) more than the cheapest one we looked at. It is not surprising that British passengers are fed up with being ripped off. A national passenger protest is happening today, the first business day after the New Year. People are heading back to work and ticket offices, train carriages and social networking sites are buzzing with the voices of irate passengers. You can join in by tweeting, texting or calling George Osborne to show your anger at fare rises. All the details can be found at www.farefail.org or by following @fairfaresnow on twitter. The bad news is it’s set to get worse. The government is still planning to press ahead with inflation plus three per cent increases in January 2013 and January 2014, meaning fares will be 24 per cent higher by the next election. When the cost of season tickets is so much higher than other European capitals, the government’s fare rises are starting to affect the UK’s competitiveness. That’s why if the government is serious about promoting economic growth it must also look at reducing planned fare rises in 2013 and 2014 as part of a policy to cut fares and make public transport truly affordable. With both in place, the question is pretty clear. Rail companies can’t run things. Government’s can’t run things. Lets spell it out. Massive subsidies for rail transport should mean cheap prices. It doesn’t. 2. Pensions are too generous. 4. Stupid projects such as Cross rail are undertaken. 5. Stupid projects such as HS2 are considered. Solution. No subsidy. No regulation bar that of safety. No guarantees for pensions. The government gets out of the business completely. If you want to see an example of transport and the right, look at Boris. 140 million on 5,000 bicycles. Mutualisation of the railways is the best way forward. Put passengers in control, turn railways into not-for-profits that reinvest in the railways and help keep fares low. Well most of the contenent is state run and they do a reasonable job, granted the old state rail system wasn;t perfect, however it would be hard to say they did not do a very good job witht he few resources available, granted no system is perfect just like the NHS yet we all expect something to be perfect but not pay for it. Either way there has been large amounts if investment in the rail network which is being reduced so the shortfall has to be made up with higher ticket prices now it would be interesting if it was non for profit how much reduced would the costs for all these projects be? Take a well run example – Switzerland. Cost of a GA (General Abonnoment) 2350 CHF for a couple. Covers all of Switzerland, bar one or two mountain railways. 800 quid at current rates per person. Salaries higher than the UK. Runs on Time (almost). Clean. Efficient. 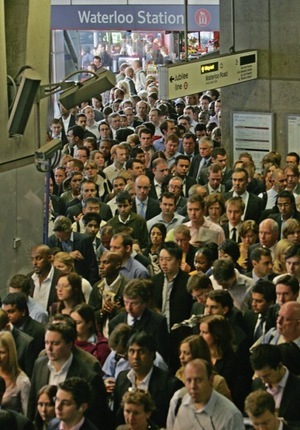 UK charges commuters 3,000 in lots of cases per person. Nearly 4 times more. In other words the commuters and the tax payers who are mugged for others to use the service are paying for a Rolls Royce service, but getting a clap out Moris Minor for their money. Take one, Cross Rail. 200,000 passengers a day top end, 16 bn cost (Olympic estimate). Debt costs per day of 3 million a day. So just to cover debts, the ticket price needs to be 15 quid. More for running costs. Will 200,000 passengers fork out 4-5 grand a year to use it? They won’t. So someone else will pay the price. Salaries are NOT the issue. And no, your banker buddies did that. You lie and lie to try and deflect attention from your 1%. Anything but reason and logic, anything but the cause paying the cost. THAT would hurt your ability to maintain your third house, after all! Oh yes, gotta have trains crashing and burning because underpaid, overworked people are dribing then. Gotta have unsafe rails. Crossrail and HS2 are self-evidently idiotic, but your other whines are just that. Gotta sacrifice safety, after all. You have a Limo, what’s it to you. And hey, right, it’s not like people being able to get work is important for the economy. We can just ask FS from Italy to run the railway. with SUCH a corrupt government ? Railways stop risk on the roads. Trains are GREAT for the economy.